Danger Danger six-stringer Rob Marcello is known as one of the fastest, most technical guitar players on the planet. A blizzard of fretboard speed, finesse and technical prowess, he’s a guitarist we could all learn from – even if Rob’s famed neoclassical shredding skills are not really your personal thing. 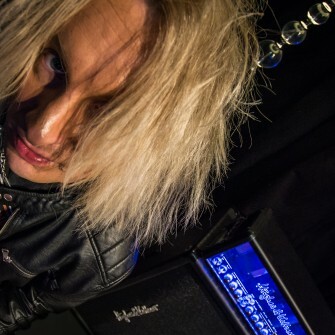 So, get your learning hats on as the Swedish sensation reveals the first riff he ever learned, his favorite guitar warmup routines, his best – and worst – onstage experiences, and loads more in our exclusive interview! No matter what kind of music you play and love yourself, it’s simply impossible to not be bowled over by Rob Marcello’s incredible bag of six-string tricks. We witnessed it firsthand and close up when Rob visited us at our headquarters in St. Wendel, Germany. His mastery of multiple styles is impressive, his pure speed around the fretboard frightening. What’s also incredible is his sheer accuracy. The performance video you can find at the bottom of the page was done in one take. Rob played through the track twice, and we selected the best one – simple as. Well, we say the best one – he never missed a note in either. Just contemplating trying to learn the intro to that piece has us breaking out in cold sweats. After witnessing that, we decided to try and get a glimpse behind that Marcello magic by quizzing Rob on his background as a player and how he went about becoming so damn good at guitar. The results of our interview are right here for you to enjoy, but just a warning: there is no secret formula. He’s just that good. But, that said, there are still a few tips in there that just might help us mere mortal guitarists on our quest for improved tone. Take it away, Rob! Rob stuck to playing the GrandMeister 36 for the interview demonstrations but, as mentioned above, we also took the opportunity to ask him to test drive the 150-watt behemoth that is the TriAmp Mark 3. He hadn’t seen the amp before, but he took a few minutes to dial in some settings that sounded good to him, and just went for it along to one of his backing tracks. We hope these Marcello masterclasses have inspired you to at least look at the guitar slightly differently. OK, 99.9% of us will never be able to play as technical well as Rob, but at least we now know playing Chuck Berry riffs over and over again is nothing to be ashamed of! And by the way, if you have other questions for Rob, let us know in the comments below – we’ll ask him next time he comes to see us! First published: August 28 2015. Most recent update: August 28 2015. Awesome! I am a big rob Marcelo fan! Is there anywhere I could go on the Internet to find some kind of tour schedule of him or danger danger?